ter logging in, you are at the Workplace. Here you get a concise overview of all your tasks. The Workplace also has a calendar and a stream, which keeps you informed on any news or updates in your tasks and projects. Our Video Tutorial shortly introduces task management with Kanban in the projects. Click on , give your new task a name and press ENTER. The new task does not yet have a start or due date or effort. If you want to change that, drag the task into the calendar to give it a due date or click on to open the Edit Task window where you can edit all the details. If you already know the due date of a task, you can e.g click on Tuesday, 10 a.m. and edit the task. Click on the button in the Top Bar to open the Edit Task window. 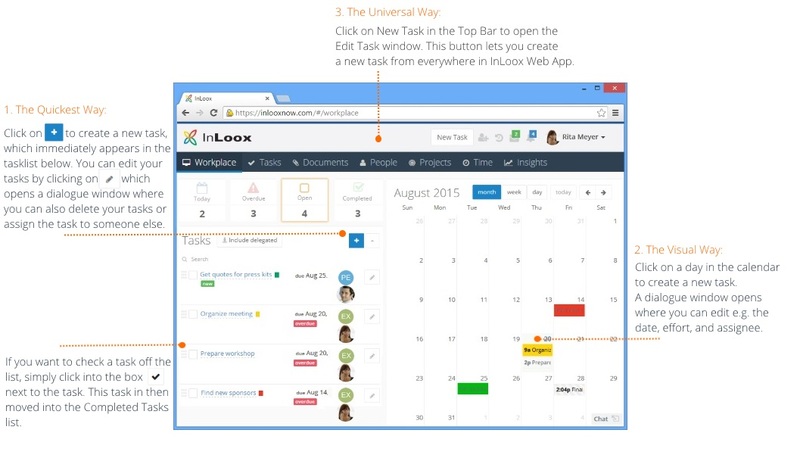 This button enables you to create new tasks from everywhere in InLoox Web App. If you want to mark a task as done, set a check in the box of the completed task. It is now displayed under the completed tasks. PLEASE NOTE Tasks that you create either in the Top Bar or Workplace are your personal tasks without an assigned project. Nobody else can see or edit these tasks. Creating a Task | InLoox 10 Web App • Copyright 1999-2019 © InLoox, Inc. All rights reserved.